Here is our newest lawn and garden product that is sure to bring you success. 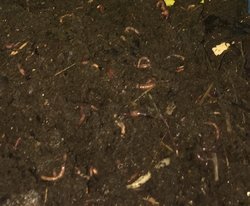 Our customers have been asking us for worms that they can use in their lawns, and now we have it. We have had to turn our customers away in the past when they have asked for this because we could not find a worm that would aerate lawn and create nutrient rich castings. Those days are over!! We now have a mixture of three species of worms that will complement each other resulting in the effect you desire. The Florida Wiggler (Pheritema)? This is a burrowing worm that will make burrows 3 to 4 ft deep and will deposit castings on top of the soil. The European Night Crawler: This is a big leaf and thatch eater. These fellas will also deposit castings on top of the soil. The third Species is the red worm. They stay within the top few inches on soil and will deposit castings throughout the soil. This mixture of three species of worms will adjust to about any climate. Excellent for new and established lawns. Comes with directions for care of garden culture. Approximately 1500 to 2000 worms per 5 lb. culture. Contains egg capsules, small and large worms. Suggested area coverage for one 5 lb. bag. Lawn - 1 bag/1000 sq. ft. Flower beds - 1 bag per 100 sq. ft.
Gardens - 1 bag per 100 sq. ft.
Order in Spring and Fall to ensure success. How Many Cultures do I need? Plan on 5 Pounds for each 600 sq feet. How many worms are in a 5 Pound culture? There are 1500 to 2000 worms of all sizes plus eggs. The culture also comes with the soil they were raised in, which will increase chances of success. How do we prepare our lawn for the worms? The first thing you have to do is stop using chemical fertilizers and pesticides. Use a mulching blade on your mower which will create thatch.? The worms will feed on the thatch and will reduce it. What do I do when the worms arrive? The worms are shipped in a five or ten pound breathable bag. The worms will need to be taken care of when they arrive. If they will not be used immediately the bags should be opened and the worms turned to get air into the bags. If you will keep for an extended period before use the worms should be placed in a bin with shredded newspaper that has been moistened. Use a light over the open bags or bin so that the worm do not try to escape. Orders come with complete instructions for success. Get rid of hard, nutrient poor soil today.